For example, when I savor a steak, arrive at a gala or call myself lazy, a non-cyclist will look at me incredulously. Apparently, because I ride a bike, I am a superbly-conditioned, badly-dressed, soy-sucking environmentalist. Don’t you hate when people generalize? The next day, the hatchback driver’s words stuck with me as I went about my errands. I started the day on the computer, assembling photos of tire treads for a friend’s bike shop. “Bike Doctor” Paul wants more novice-friendly signage at his store and I offered to help him with marketing materials over the summer. Later in the afternoon, I pedalled over to Main Street for an americano misto to get caffeinated for my next stop, a meeting with my local cycling policy advocates. I’d recently been elected to the board of the Vancouver Area Cycling Coalition, and I was keen to hear what the marketing committee had to say about rebranding and (in my words) “sexing-up” the venerable organization. Paul had invited me over for salmon and hemp beer after the meeting, so I headed up to his house and locked my bike next to the tall, cargo, art and kids’ bikes in his backyard. We grinned at a video of a marriage proposal spelled out in MonkeyLectric bicycle wheel lights. Paul slipped on his shiny western with Scotchlite fringes and we pedalled through the drizzle to a Gastown warehouse space. Paul’s partner and a collective of other bikey women were hosting a B:C:Clettes sock-hop. We locked our bikes under covered racks at the Woodwards building and navigated souvenir shops, night clubs and a dilapidated staircase to join the party. My caffeine-and-hemp-beer buzz fizzled about midnight, so I bowed out and descended down to the boozy alley where smoking nightclubbers joked with a bar band loading up their gear. As I approached the bike racks I noticed an older fellow curiously circling the bikes. He was frayed from years of living on the streets, but his gaze was clear as he surveyed each bicycle. He wandered over to a bike and beckoned me over. “This one, they left the light on – maybe you want to turn it off? I’d do it myself,” he shrugged, “But I’m a homeless guy, and you never know…” He stepped aside and I flicked it off. I returned to my bike and he followed me. “Listen,” he said as he opened his black backpack and reached inside. “I want you to have this. See – it’s sealed, it’s good. My gift.” He pulled out a package of maple-flavored tea – the kind tourists buy from the nearby souvenir shops. 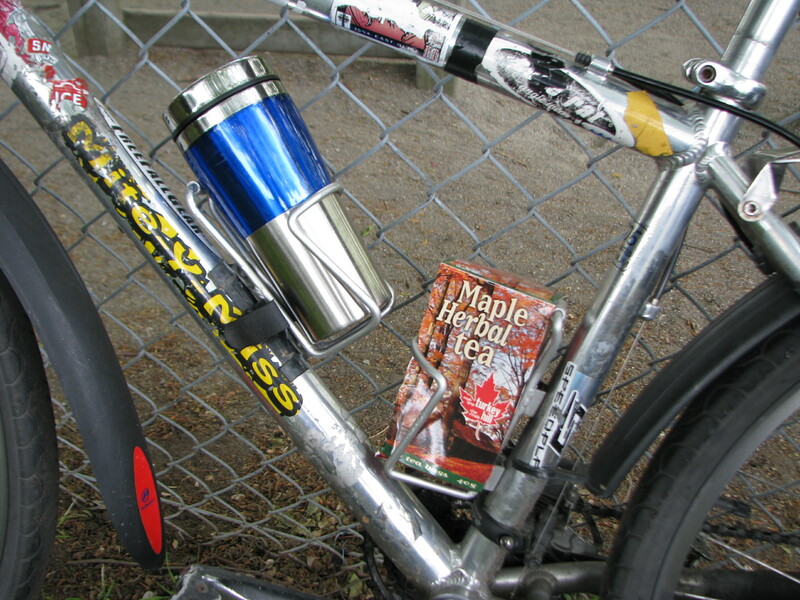 “Yeah,” I said, accepting the cello-wrapped box, “Us cyclists like tea.” I thanked him and wished him a safe night. You can try to lump us together, but there’s no such thing as a typical cyclist. We ride for different reasons. Some of us cycle to connect with the world around us – for better or worse, for insults or tea. It all seems to balance out. We get it all, just riding a bike. Us cyclists. Published in the July/August 2010 issue of Momentum: the magazine for self-propelled people.